We’d love your help. Let us know what’s wrong with this preview of You Fit The Pattern by Jane Haseldine. Crime writer Julia Gooden has just completed the most important story of her life—a book about her beloved brother’s childhood abduction and how she found his killer after thirty years. But that hasn’t taken her focus off her day job—especially with what looks to be a serial killer terrorizing the city. Female runners are being snatched off jogging trails, then slaughtered Crime writer Julia Gooden has just completed the most important story of her life—a book about her beloved brother’s childhood abduction and how she found his killer after thirty years. But that hasn’t taken her focus off her day job—especially with what looks to be a serial killer terrorizing the city. Female runners are being snatched off jogging trails, then slaughtered in abandoned churches. As Julia begins investigating, with help from Detective Raymond Navarro, she realizes just how personal this case has become. The murders, planned and executed with uncanny precision, are of women who share traits with Julia. Now he’s contacting her directly, insisting things will get much worse unless Julia makes him famous through her writing. To ask other readers questions about You Fit The Pattern, please sign up. Is it customary for authors to deliberate damage their books by jamming a screwdriver outward through the front cover? I was looking forward to receiving this book as one of the giveaway winners. The book just arrived and is so damaged that I can't imagine holding it to read. At minimum, I need to pluck out the cardboard shards and put tape over the cover or something, just to be able to comfortably hold it. There is a serial killer loose in Detroit and he is targeting size 2 brunettes who run; women just like journalist Julia Gooden. The murders are vicious and the victims aren't related in any way apart from their resemblance to Julia. The ritualistic murders incorporate elements of voodoo, Satanisn and Wicca and the killer has a fondness for cat and mouse games with Julia. Full of twists, tension, and great writing this was a thrill ride from page one! Thanks to Netgalley and Kensington Books for a digital galley in exchange for an honest review. Although this is the fourth book in the series, I felt that the author provided enough character background to treat it as a standalone. A contemporary mystery thriller set in Detroit, Julia Gooden, a local reporter soon becomes entangled with a police investigation. Single mothers who run in the local parks are ending up dead and they all bear a striking resemblance to Julia. I felt that the novel was evenly paced and I was able to read it one sitting. I was certain that I had figured out who the "killer" was just from his first couple of narrated chapters, but then Jane Haseldine threw me off for a bit. I like when authors give their readers a few "likely" suspects. It was the cover that drew me in, but I truly enjoyed the story within. 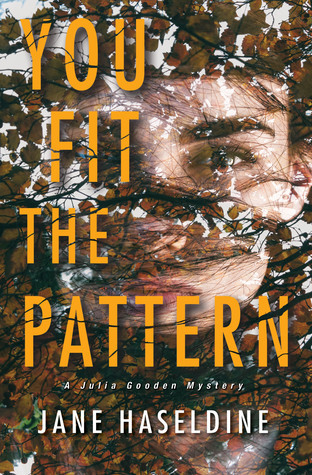 You Fit The Pattern by Jane Haseldine is the fourth book of the Julia Gooden Mystery series. Each book of the series seems to have it’s own mystery to solve although I have not read the first three myself. Julia Gooden who is a main character of this series is a crime writer who is no stranger to serial killers having lost her own brother to a killer years ago. When female joggers begin to fall victim to a new killer Julia finds herself even more entwined in the case when it seems the victims bar You Fit The Pattern by Jane Haseldine is the fourth book of the Julia Gooden Mystery series. Each book of the series seems to have it’s own mystery to solve although I have not read the first three myself. Julia Gooden who is a main character of this series is a crime writer who is no stranger to serial killers having lost her own brother to a killer years ago. When female joggers begin to fall victim to a new killer Julia finds herself even more entwined in the case when it seems the victims bare a striking resemblance to Julia herself. Picking up You Fit The Pattern I didn’t realize at the time that it was part of a series as I prefer trying to read them from the beginning just for the character building which takes place through each book. Being the fourth there obviously was some background I had missed so that makes it a bit tougher to really become immersed with the story. However, I did find the mystery in here compelling and believe if it hadn’t taken a bit to warm up I would have rated a bit higher than 3 1/2 stars. You Fit The Pattern by Jane Haseldine is the fourth book in this series to feature crime reporter Julia Gooden. I did not realise this when I started reading it and I have to say that it read fine as a stand alone book. In saying that though I really enjoyed this book and am keen to go back and read more about these characters. I really liked Julia, a single mother working hard to balance her family and work. She is gutsy and stubborn and her family is everything to her. She has a tragic past wh You Fit The Pattern by Jane Haseldine is the fourth book in this series to feature crime reporter Julia Gooden. I did not realise this when I started reading it and I have to say that it read fine as a stand alone book. In saying that though I really enjoyed this book and am keen to go back and read more about these characters. I really liked Julia, a single mother working hard to balance her family and work. She is gutsy and stubborn and her family is everything to her. She has a tragic past which makes her and even stronger women for getting through what she did. In this book she has found love again and is finally starting to be happy again. After finishing her book Julia is thrown straight into a serial killer case that becomes personal for her. The killer is targeting young, single mothers who like to go running in the parks. He takes them and kills them in abandoned churches in the town. Working with Detective Raymond Navarro this case twists so many times. And then the killer contacts her directly and suddenly her life is in danger. The ending was fantastic and in no way predictable . This is the fourth book in a series following crime reporter Julia Gooden but I jumped into this series at book three and had no problem catching on. I think you could read any of these as standalones as each book focuses on a new case and also fills in enough background information that it’s easy to follow along. Julia is such a fun lead character, she’s smart, feisty and fearless which makes for some seriously interesting and entertaining scenarios. There was a personal angle for Julia with thi This is the fourth book in a series following crime reporter Julia Gooden but I jumped into this series at book three and had no problem catching on. I think you could read any of these as standalones as each book focuses on a new case and also fills in enough background information that it’s easy to follow along. Julia is such a fun lead character, she’s smart, feisty and fearless which makes for some seriously interesting and entertaining scenarios. There was a personal angle for Julia with this case which is one of my favorite approaches, I love simultaneously learning something new about the character while exploring a new, creepy case. The case here was super creepy, think voodoo, black magic and rituals and I was caught up in the intricacies and details the author provided all the while being super engaged throughout. I feel like both of the books I’ve read in this series have been like classic whodunnits, they’re well thought out and always keep me on my toes and manage to surprise me in the end. Combine a good old fashioned murder mystery with a compelling protagonist and I’m happy. I’m quickly learning that Haseldine delivers on all counts and is an author I’ll continue to follow. You Fit the Pattern is a story about Julia Gooden, a crime reporter in Detroit, Michigan. Apparently, this book is the fourth in a series. I had no idea when I started reading it, but I promise, I had no issues at all falling into the story and quickly warming up to Julia’s character. She’s smart, sassy, and holds her own in a world surrounded by macho men. Julia, with the help of the police, starts hunting a serial killer who is targeting women who happen to have a lot in common with herself. T You Fit the Pattern is a story about Julia Gooden, a crime reporter in Detroit, Michigan. Apparently, this book is the fourth in a series. I had no idea when I started reading it, but I promise, I had no issues at all falling into the story and quickly warming up to Julia’s character. She’s smart, sassy, and holds her own in a world surrounded by macho men. Julia, with the help of the police, starts hunting a serial killer who is targeting women who happen to have a lot in common with herself. The killer is into voodoo, black magic, and pagan rituals which is revealed by the crime scenes of the two single moms that he’s murdered so far. I’ve always been fascinated by Voodoo culture in Louisiana (obsessed with New Orleans). The killer doesn’t stand a chance with Julia’s relentless wit and the story that unfolds is captivating, exciting, and doesn’t let the reader down with twists and turns and a great and shocking ending. I highly recommend this book. It was a quick read, probably because I couldn’t put it down. I just added the other three in the series to my TBR because I need more of Julia Gooden! Thank you to NetGalley, Jane Haseldine and Kensington Books for the free e-book in exchange for an honest review. Crime reporter Julia has finally finished the biggest story of her life, the story of the abduction and murder of her brother and how she solved the crime after almost thirty years. But that hasn’t stopped her from doing her job when there is a serial killer hunting female runners in the city. The runners are being snatched off the trail and slaughtered in abandon churches. Julia begi Thank you to NetGalley, Jane Haseldine and Kensington Books for the free e-book in exchange for an honest review. Crime reporter Julia has finally finished the biggest story of her life, the story of the abduction and murder of her brother and how she solved the crime after almost thirty years. But that hasn’t stopped her from doing her job when there is a serial killer hunting female runners in the city. The runners are being snatched off the trail and slaughtered in abandon churches. Julia begins investigating with her boyfriend police officer Navarro and she realizes just how personal this case has become when she seems one of the victims. The murder victims are all dressed to look like her and the killer begins contacting her directly to make a game of the murders. Can Julia stop herself from being the next victim? This is quickly becoming one of my favorites series’ going! I read only the last two books and I wasn’t lost at all. I loved picking these up because they are really quick reads because you don’t want to put them down! I read this novel in one sitting because this novel is too action packed to put down. I love Julia’s character and how much more we see of her family in this novel and more of her personal life. Julia is a unique character in my opinion and that makes me like her all the more; she seems like someone you want to be friends with and would trust with your story. I loved the dark and sketchy atmosphere to the novel and how you suspect so many different people before you find out who actually is the killer. I loved that the killer started to involve Julia and leave her clues to allow her to think that she can save some of the other women. The ending to this novel was the best, I don’t want to give anything away, so just read it! Julia is back! Crime writer Julia Gooden has finished her book on her brother's abduction and murder when he was a child. And she has helped put his killer behind bars. It's a good story, but her editor wants more emotion and Julia isn't sure she wants to do that. She's not letting that get in the way of investigating other crimes. Someone is abducting women joggers and leaving them dead in empty churches with cryptic drawings in their hands. And all wearing the same dress. The exact dress Julia wore at a police function with her boyfriend Ray Navarro once. As Julia digs into the case she gets a call from the killer himself. He wants to be famous and he wants her to make him famous by writing his story. He'll even give her little clues to the next murder. As the case evolves Julia and the police come to understand that this one is personal. That Julia is the intended last victim. But why? And who is this person? This is one of my favorite series. Julia is no one's victim and Ray has no intentions of her being one. There were some really good new characters in this one and a lot of misdirection which had me over thinking everyone. Well Done! A big thank you to Kensington and the author for a copy. Detroit investigative crime reporter Julia Gooden is back in the fourth installment of author Jane Haseldine's series, You Fit the Pattern. After solving her brother's murder thirty years after he disappeared, Julia has written a book about the case. But now a serial killer is on the loose in Detroit, targeting female runners. The killer abducts the women from their jogging trail, and then kills them and stages their bodies in abandoned churches. When Julia's boyfriend, Detective Raymond Navarro Detroit investigative crime reporter Julia Gooden is back in the fourth installment of author Jane Haseldine's series, You Fit the Pattern. When Julia's boyfriend, Detective Raymond Navarro, and the Detroit PD begin investigating the cases, it becomes clear that the killer is obsessed with Julia. All of his victims share traits with Julia, and the murderer contacts Julia directly, threatening that things will get much worse unless Julia makes him famous through her reporting of the story. Julia convinces the Detroit police chief to embed her in the investigation -- with specific caveats -- in order to assist the detectives. But Julia is playing a dangerous game because no matter how skillful and careful she is, the killer's ultimate goal is clear. Julia must unravel the threads linking the killer’s twisted mind to her own dark past in order to escape becoming his final victim. Haseldine has once again crafted a taut, complex thriller with the beloved Julia at the center of the action. She is moving cautiously forward with Navarro, her young sons' welfare always her prime consideration. She has finished the most challenging project of her career -- the telling of the story of her beloved brother Ben's abduction, killing, and how Julia finally found his killer thirty years later. However, her editor is less than thrilled with a project and the criticism is difficult for Julia to hear. She does not have time to dwell on the necessary rewrites, however, when a series of grisly, precisely planned killings of female runners put Detroit citizens on alert. The killer's motive is a mystery -- none of the victims are sexually assaulted. However, they are found wearing the same blue dress and a long, dark wig, and their bodies are left in abandoned inner city churches. Haseldine takes readers into the mind of the killer. In alternating chapters, she narrates Julia's work with the police -- and her tendency to go rogue -- while describing the thoughts and motivations of the killer. Along the way, several characters are potential subjects, but Haseldine expertly keeps readers guessing, as clue after clue brings their guilt into question. As always, the cast of supporting characters, including Navarro, his fellow detectives and the chief, Julia's children, and her devoted but beleaguered housekeeper, is both eclectic and endearing. The action is nonstep, and the book's pace builds to a frantic level as Julia, et al. zero in on the killer's identity and location. You Fit the Pattern is another exciting and entertaining chapter in the beloved Julia Gooden adventures series that keeps readers guessing about the killer's identity right up to the very end. However, as satisfying as it is, it also leaves readers clamoring for the next book in the series, especially to check back in on Julia's relationship with Navarro, as well as see what her next big story will be about! While thus is the 4th book in a series I was able to pick this one up and read it without getting confused at all. However, everything felt overly predictable to the point it was no longer entertaining and I was just having to wait until the author got to the point, After looking at some other reviews I am apparently the only one that feels this way and see that most people have enjoyed this book. I think a person that is newer to the thriller genre would enjoy this book but if you are a seasone While thus is the 4th book in a series I was able to pick this one up and read it without getting confused at all. Crime writer Julia Gooden has just completed the most important story of her life—a book about her beloved brother’s childhood abduction and how she found his killer after thirty years. But that hasn’t taken her focus off her day job—especially with what looks to be a serial killer terrorizing the city. Female runners are being snatched off jogging trails, then slaughtered in abandoned churches. Thank you to net galley and the publisher for giving me the opportunity to read this book it was a gre Crime writer Julia Gooden has just completed the most important story of her life—a book about her beloved brother’s childhood abduction and how she found his killer after thirty years. But that hasn’t taken her focus off her day job—especially with what looks to be a serial killer terrorizing the city. Female runners are being snatched off jogging trails, then slaughtered in abandoned churches. I received a free copy in exchange for an honest review. Many thanks to NetGalley and Kensington Books! In hindsight, I probably should have read the other books first and checked if this was part of a series. Yes, you can read this book as a standalone, but the character development and interactions may be best enjoyed in context. Still, I liked this enough and kept me entertained as I read. Julia Gooden is a reporter who writes about crime and is currently writing a book about her brother's tra I received a free copy in exchange for an honest review. Many thanks to NetGalley and Kensington Books! In hindsight, I probably should have read the other books first and checked if this was part of a series. Yes, you can read this book as a standalone, but the character development and interactions may be best enjoyed in context. Still, I liked this enough and kept me entertained as I read. Julia Gooden is a reporter who writes about crime and is currently writing a book about her brother's tragic murder. In this book, a serial killer appears who may have a strange interest in Julia. Right off the bat, I'd say that for me, this was more of a thriller than a mystery. The whodunnit aspect was more played down in favor of adding tension and suspense with the killer's taunts and creepy phone calls, not to mention his own point of view chapters. I think that the POV chapters featuring the killer and the victims were more interesting than the rest. It's been a while since a book kept me up all night, turning pages to see if I am right about the whodunnit and why-they-dunnit. Jane Haseldine's YOU FIT THE PATTERN definitely did that. Creepy, chilling, creepy, terrifying, creepy, suspenseful . . . did I mention it was creepy? A serial killer who uses a mix of voodoo, maybe a bit of hoodoo, Satanism, pagan rituals, and who knows what else has targeted investigative reporter Julia Gooden, and she and her boyfriend, Detroit PD Detective Ray Navarr It's been a while since a book kept me up all night, turning pages to see if I am right about the whodunnit and why-they-dunnit. Jane Haseldine's YOU FIT THE PATTERN definitely did that. A serial killer who uses a mix of voodoo, maybe a bit of hoodoo, Satanism, pagan rituals, and who knows what else has targeted investigative reporter Julia Gooden, and she and her boyfriend, Detroit PD Detective Ray Navarro, find themselves racing to find the killer before his next victims are killed. Mysteries that keep me guessing keep me coming back for the next in the series. And I am hoping that author Haseldine has more adventures ahead (but maybe a little less creepy; my heartbeat needs time to return to normal ☺). Jogging overplayed. Silly, but it’s my truth. 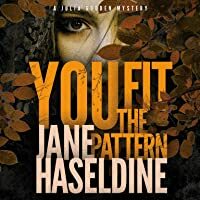 You Fit The Pattern by Jane Haseldine is the 4th book in the Julia Gooden Mystery series, and another great addition. Wow, this book is a roller coaster ride from start to finish. I really enjoyed this book/series and strongly recommend it for people who enjoy a good mystery/thriller. I also enjoyed the first three books in the series, The Last Time She Saw Him. Duplicity, and Worth Killing For. This book can be read as a stand alone, but you get a deeper understanding by reading the books in or You Fit The Pattern by Jane Haseldine is the 4th book in the Julia Gooden Mystery series, and another great addition. Wow, this book is a roller coaster ride from start to finish. I really enjoyed this book/series and strongly recommend it for people who enjoy a good mystery/thriller. I also enjoyed the first three books in the series, The Last Time She Saw Him. Duplicity, and Worth Killing For. This book can be read as a stand alone, but you get a deeper understanding by reading the books in order. Looking forward to the next book by this author. A story about a serial killer that preys on young women. The murders revolve around small built women that go jogging. There are many twists and turns that keep you wanting to know where the author is going with the story. Julia Golden, a local reporter, is the main character. She becomes more and more involved in the murder investigations when the killer contacts her directly. As the investigation progresses, it comes to light that the murdered women bare a remarkable resemblance to Julia. Thank A story about a serial killer that preys on young women. The murders revolve around small built women that go jogging. There are many twists and turns that keep you wanting to know where the author is going with the story. This is a 4th book in a series featuring crime reporter Julia Gooden. I have not read the others but I definitely will now. The books can be read standalone also. I feel like this story was good and it was boring all at the same time. It was a rollercoaster of suspense and lagging and at times I skimmed over. The story was well written and I seriously thought I had it figured out and until I didn’t. The author kept me on my toes through out most of the book. I just felt some parts were a little too slow. I loved this book! It kept me hooked and on edge from the first chapter and I didn't feel confused even though I was jumping into an established series. A solid mystery book and will definitely be on the lookout for the other titles by this author. I won a copy of this book via a Goodreads Giveaway. This is the first in the Julia Gooden series that I have read. In fact I had no idea this one the first in a series which means this author has the ability to give readers everything they need without them becoming lost or wondering this if this book is part of a series or stand a lone novel. Which as a reader I find impressive. You Fit The Pattern is a dark gritty story with characters who are real, flawed and strong. The Author pulls readers in from the first page having them wondering who will This is the first in the Julia Gooden series that I have read. In fact I had no idea this one the first in a series which means this author has the ability to give readers everything they need without them becoming lost or wondering this if this book is part of a series or stand a lone novel. Which as a reader I find impressive. You Fit The Pattern is a dark gritty story with characters who are real, flawed and strong. The Author pulls readers in from the first page having them wondering who will be next. The murders a frighting, real and has readers looking over their shoulders. I love how the police worked with the journalist who wants to bring peace to families who lost loved ones. While writing the news. You Fit The Pattern is very human the characters their back stories as well at the side story creates a world that readers will not want to leave util they find the answers that Julia is seeking. Jane Haseldie created a characters who will have readers wanting more from her. Julia is strong passionate and real to the point a reader could be running on the same trail as her. Detroit, MI. A woman is found murdered in an abandoned church with a voodoo mark left on her, and a clue. Except the clue isn't pointing to her killer, but his next victim. The Magic Man Killer is snatching single mothers out running in the early morning. His final goal? Julia Gooden, reporter at a local newspaper, who just so happens to be writing about the murdered woman. This page turner kept me up past my bedtime because I had to know how it ended and if I had worked it out. I hadn't. Solid p Detroit, MI. A woman is found murdered in an abandoned church with a voodoo mark left on her, and a clue. Except the clue isn't pointing to her killer, but his next victim. The Magic Man Killer is snatching single mothers out running in the early morning. His final goal? Julia Gooden, reporter at a local newspaper, who just so happens to be writing about the murdered woman. Author, Jane Haseldine, has added to her ‘Julia Gooden Mystery’ series with this book - “You Fit The Pattern”. I have not read the first three books in this series, ‘The Last Time She Saw Him’, ‘Duplicity’, and ‘Worth Killing For,’ so I didn’t really know what to expect here, however I needn’t have worried as I thought it was a fantastic read and I was so glad it had caught my attention! I did not feel disadvantaged in any way not having read the other three books first as it was a perfectly fine Author, Jane Haseldine, has added to her ‘Julia Gooden Mystery’ series with this book - “You Fit The Pattern”. I have not read the first three books in this series, ‘The Last Time She Saw Him’, ‘Duplicity’, and ‘Worth Killing For,’ so I didn’t really know what to expect here, however I needn’t have worried as I thought it was a fantastic read and I was so glad it had caught my attention! I did not feel disadvantaged in any way not having read the other three books first as it was a perfectly fine read as a stand-alone story, though it would have been preferable to me if I had read them in their intended sequence. “You Fit the Pattern” is a creepy, suspenseful and extremely chilling psychological thriller, set in Detroit. For me, Julia Gooden as the protagonist worked well in this extremely well-paced thriller and the author Jane Haseldine has drawn a great character in this gutsy crime-writer. I really invested in this character and I wanted her to succeed. The other characters were also brilliantly drawn and were well portrayed as being very strong and real, if not without faults and added depth to the story. I particularly liked Detective Navarro. Jane Haseldine’s writing style is really engaging and it was a good, fast-paced read with more than one false lead that threw me off the scent. Full of so many twists and gripping tension, this was a thrilling and compulsive read from the offset and there was even an element of romance! The conclusion was a very fulfilling ending to a wonderful book that regularly had me looking over my shoulder and was, all-in-all, a very worthwhile and well-balanced read. Thanks to NetGalley, Kensington Books and the author, Jane Haseldine, for my free ARC of You Fit The Pattern. My honest review was completely voluntary. Hunting a killer through the eyes of crime journalist Julia Gooden. Author does a good job creating flawed, believable characters that readers will care about. Best to start with book 1 to get a good feel for the personal lives of the characters. No cameras? In the bar, the bookstore, in the parks, on the highway? In today's world cameras are everywhere. “You Fit the Pattern,” Jane Haseldine’s fourth hardboiled mystery featuring hard-nosed Detroit reporter Julia Gooden, is entertaining but meanders from its usual high series standards. A serial killer is targeting young female joggers in Mayberry State Park in the suburbs of Detroit, Michigan. In the opening chapter, single mother Heather Burns is out running her usual route when she encounters a stranger in the parking lot. Heather notices the woman again while using the restroom. But things aren “You Fit the Pattern,” Jane Haseldine’s fourth hardboiled mystery featuring hard-nosed Detroit reporter Julia Gooden, is entertaining but meanders from its usual high series standards. Heather notices the woman again while using the restroom. But things aren’t what they seem, and Heather realizes the stranger’s odd behavior—her voice, and the way she moves, are not the attributes of an elderly woman. She’s too agile, and her hasty movements and wig become apparent that Heather is dealing with a different kind of person. Heather becomes one of a handful of victims, her body later found in an abandoned church by Detroit Police as they investigate the crime. Strange symbols are being left on the victims’ bodies, sexual and religious references. As the police and crime reporter Julia Gooden investigate further, they discover a terrifying pattern emerging among the victims. The bodies are being clothed in blue dresses and different colored wigs, a pattern shaped to resemble Julia Gooden, the killer’s main target. A teasing of backstory on the serial killer heightens the suspense and mystery, and Haseldine does a good job creating flawed, believable characters that readers will care about. But the emphasis on the occult and black magic seems out of place and requires suspension of disbelief. One of the best books I've read this year! Jane has done it again with class, style, and a plot that dares to challenge every readers mind! In this remarkable story Julia Gooden (crime writer) has just completed a book about her brother's childhood abduction and the killer she placed behind bars. The too numerous to mention twists and turns will have you glancing over your shoulder because the women runners are being snatched up from jogging trails and killed in abandoned churches. There's another c One of the best books I've read this year! There's another catch -- the women being killed bare a canny resemblance to Julia. The clock ticks with Det. Navarro by her side they must end this NOW before Julia gets killed. The serial killer she now faces will not stop until he gets what he desperately wants and that is JULIA! My word this had me gasping for air all the way through. You Fit the Pattern for me was a nail biter that had everything a true thriller needs including the passion, the intensity, the dynamic to keep readers intrigued. As a super fan of Jane's work I can tell you after reading the past 3 novels she is one superb writer! Congrats on another great novel that is a must read for 2019! Thank you to Jane, and her publisher, for providing me this ARC in exchange for this honest review. This ARC will be donated to The Hoyt Library Kingston Pa in loving memory of my niece Cassie Ann Gatcha. You Fit the Pattern is book four in the Julia Gooden series. That being said I did not feel like a had to have read the previous three books in order to read and understand this one. There were moments where I wish I knew more because some things weren't explained but they were not crucial enough that I couldn't get what had happened in the past and how it effected the now. This novel was a pretty good crime novel. Julia is a crime beat reporter in Detroit and there is a new killer that is dressi You Fit the Pattern is book four in the Julia Gooden series. That being said I did not feel like a had to have read the previous three books in order to read and understand this one. There were moments where I wish I knew more because some things weren't explained but they were not crucial enough that I couldn't get what had happened in the past and how it effected the now. This novel was a pretty good crime novel. Julia is a crime beat reporter in Detroit and there is a new killer that is dressing his victims up like her. The story progressed well and didn't really drag. The character interactions were well done and it was nice that there were a few moments from the killer's POV. Haseldine keeps you guessing until the end but I was not surprised and felt very strongly when we met that character that he was the one. Jane Haseldine writes the Julia Gooden mystery series for Kensington Publishing, including The Last Time She Saw Him, Duplicity, and Worth Killing For, which will be published in March 2018. Jane is a journalist, former crime reporter and also worked as a deputy director of communications for a governor. Jane lives in Southern California with her husband and two sons.